Ernest Barker was born in Stokesley in 1888. He was the elder son of Edward Barker and Christiana Ford, who married in Stokesley in 1884. Edward had also been born in Stokesley, on 26th May, 1842, and was a retired ironmonger. The couple set up home in Back Lane and by 1891, Edward and his wife had two sons, the younger being named Thomas. He was then only a year old, but died aged only 4 years. Ernest was educated at Barnard Castle School where in 1901 he is recorded next to George Henry Barker, another Stokesley boy, the son of Henry and Elizabeth Barker. The fathers of the two boys were brothers, so the boys were cousins. Edward and Christiana had moved to High Street in 1901 and to South Side by 1911. By this time their son Ernest had left the parental home to follow a career in banking, and was in lodgings at 2. Bath Terrace, Seaham Harbour in the house of the Talmadge family. He continued to follow this profession even after the war broke out, moving from Seaham to Bridlington with his employment. By chance, Ernest’s attestation papers (recording his enlistment into the army) still survive, so we know that he enlisted on 8th December, 1915, as Private 764063 (not 764062 as in the Book of Remembrance) in the 28th County of London Battalion of the London Regiment, (a unit more commonly known as the Artists' Rifles). Ernest Barker was then 27 years and 5 months old, a bank clerk living at 7. Carlton Terrace, Bridlington. He gave his mother’s name as next of kin – his father had died in 1913 – and her address as South Side, Stokesley. (Christina later moved to Bright Street, Middlesbrough). Ernest’s army medical records give us a good picture of him. He was nearly 5ft. 10ins tall, and weighed 11 stones. His chest measurement is given as 38 inches with a three inch expansion and so it appears that unlike so many recruits, Ernest was a well-developed and fit young man. 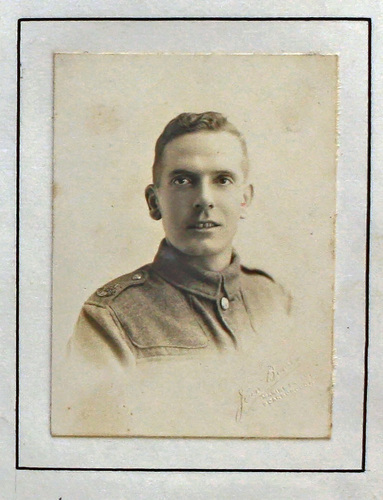 Ernest Barker was 29 years old when he fell and was awarded the British War Medal and Victory Medal, but they had not been claimed by 6th June, 1922. He has no known grave, but his name is commemorated on Panel 153 of the Tyne Cot memorial in West-Vlaanderen, Belgium. Go to next soldier Barker H.